As is the usual every year, the United stars make an appearance at the awards dinner in the Manchester Suite, where guests take a look back on the season gone by, take part in charity auctions, and most importantly, learn who is the winner of the big awards. As was the case of years gone by, life long United fan and ITV host Jim Rosenthal presented the night from the stand. Its a great achievement for the players, It was a big challenge for me and the players. This present team can go on and do very well, they’re a cracking bunch of players,” said Ferguson. “Its my best squad, I could have picked 2 teams for the Arsenal game. They’re very good players and great characters. “I started 2 weeks ago, doing a video analyses of them, trying to pick a team they will play, watching their games,” moving onto the selection, “Ji Sung park won’t be disappointed, he will be in the team. He won’t be left out this time. It broke my heart last year to leave the lad out,” acknowledging Darren Fletcher’s unfortunate suspension, “Its a bitter disappointment, he’s a gentleman. Darren’s temperament is never up or down, he just trotted off after getting the red and it says a lot about the lad. They would have been my top tip when watching them earlier in the season, that they could go all the way. It’ll be a repeat of last seasons semi-final only this time it’s one leg. Well I can be as confident as I can, we’ve won the league and I’m going with a fresh team, bar Fletcher and Rio Ferdinand will be fit for the game. 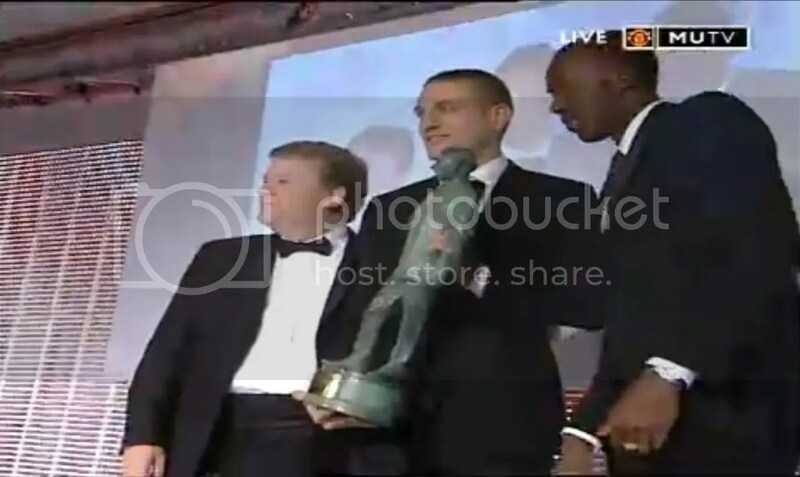 Federico Macheda scoops an award to savour. Making stunning appearances for all 3 levels of United this season, earning the first team 6 points with two winning goals. United legend Bryan Robson presented Federico with his award. 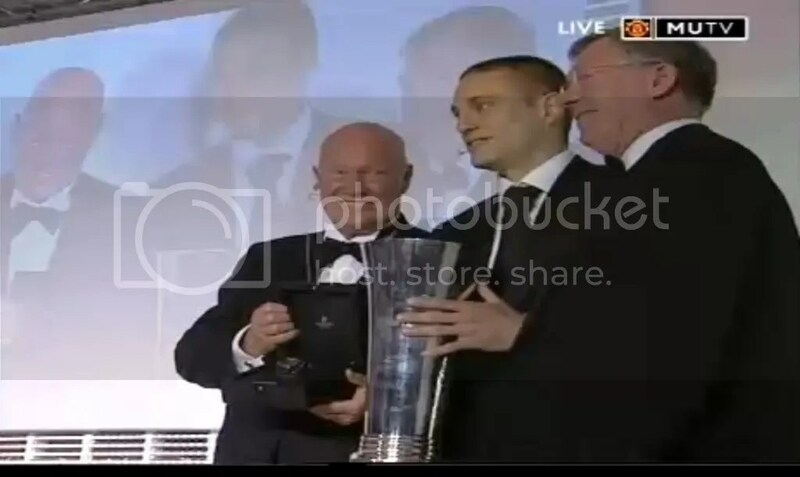 Nemanja Vidic wins the Sir Matt Busby Award after a stunning season. He’s been like a rock in defence and I don’t think there can be any debates about the winner. Vidic was presented the trophy by Carl Wright and Olympian, Usain Bolt. I’m honoured. It’s amazing to get these awards. I’m very happy here at United. I enjoy being here every day and playing with these players and working with the coaches. Congratulations to all the winners and people involved. 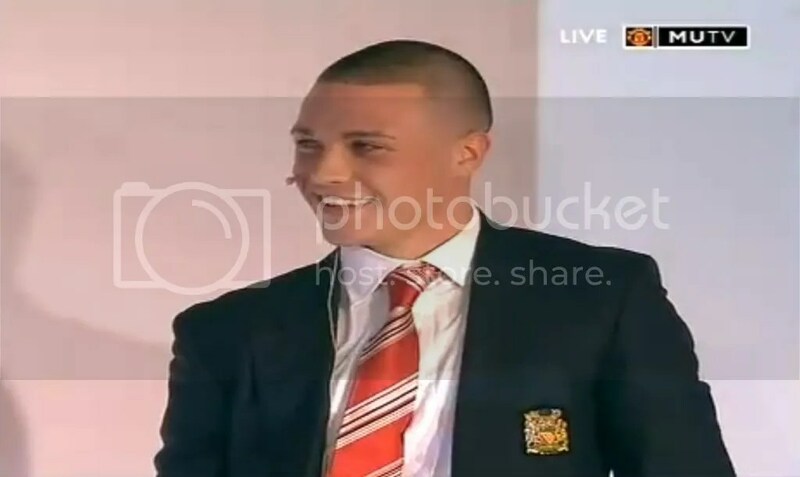 Also, well done to Carl Wright who bought the honour of presenting Nemanja Vidic with the Fans Player Of The Year award after winning it in an auction for charity earlier in the night for a tidy sum of £7,000. This entry was posted on May 17, 2009 at 10:06 pm	and is filed under General News. 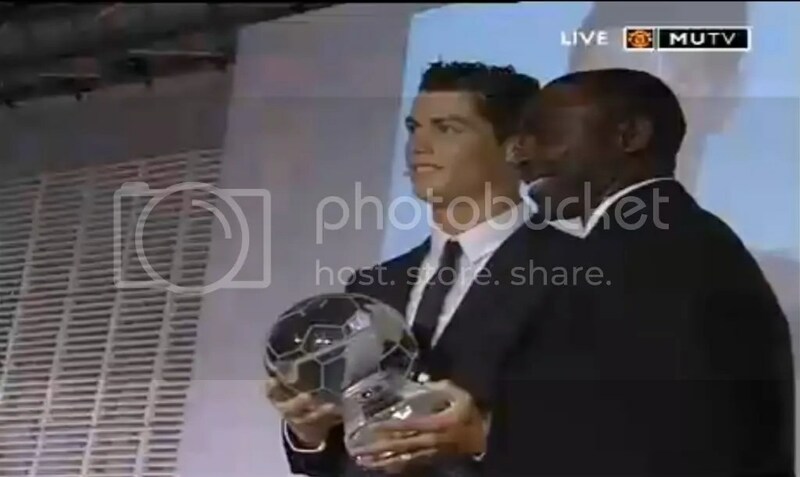 Tagged: Awards, Carl Wright, Champions League, Cristiano Ronaldo, Danny Welbeck, Federico Macheda, James Chester, Jim Rosenthale, Matt James, Nemanja Vidic, Old Trafford, Ryan Giggs, Sir Alex Ferguson, Usain Bolt, Wayne Rooney. You can follow any responses to this entry through the RSS 2.0 feed. You can leave a response, or trackback from your own site.